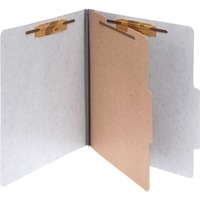 Heavy duty PRESSTEX Classification folders offer better functionality than most binders and pocket folders when you need to keep your business files organized. This document folder functions as the perfect file organizer, complete with tabs on the cover and dividers for easy titling. Tyvek reinforced expandable file gussets provide maximum durability. 1 size fasteners match the number of folder parts. Folder offers four parts and expands to 2.